The Sussex Spaniel has a long, low, rectangular frame covered in a wavy, feathered coat that usually comes in a nice golden liver. Its broad, flat-topped, slightly indented head has a heavy brow, a wide muzzle, brown nose, hazel eyes and large, feathered ears that hang close. Its thick tail, sometimes docked, is normally carried horizontal or high. 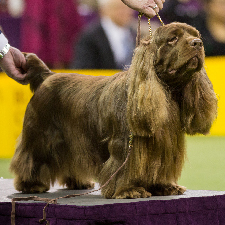 Bean the Sussex Spaniel at the 2018 Westminster Kennel Club Dog Show. Photography by Kayla Bertagnolli. Compared to other spaniels, the Sussex Spaniel is quite relaxed and sedate. Around the house, it is likely to hang out, lumber from room to room and maybe bark a little. Friendly and open, the Sussex loves everybody and everybody loves it right back. This dog is a devoted and loyal friend for life. The Sussex Spaniel is an especially good companion to children. When the Sussex hits the open field, its hunting instincts take over and the energy level really picks up. It romps through forests, fields and streams, barking and baying at birds, squirrels and the like. 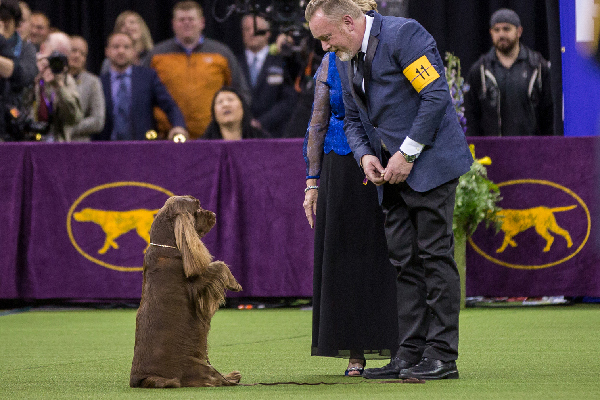 The Sussex Spaniel is clever and loyal, but sometimes it can have a mind of its own. Make sure its training is consistent and positive. The Sussex Spaniel can live as long as 16 years with relatively few genetic health issues. The most common problems associated with the breed are heart problems, ear infections, hypothyroidism and eye problems. Its long and wavy coat does require some maintenance. Brush it regularly and trim excessive hair that grows under the feet and under the ears. Also check its ears regularly for signs of infection. The Sussex Spaniel originated in Sussex, England. Developed by a breeder named Fuller, the liver-colored Sussex Spaniel was intended to be a sporting dog. Not particularly fast or boisterous, it was nevertheless a determined and loyal companion in the field. Today, the Sussex is rare, but its numbers are growing in both the U.S. and Great Britain.